Stop this nonsense talk about Argentina not making the 2010 World Cup finals. Stop it right now. 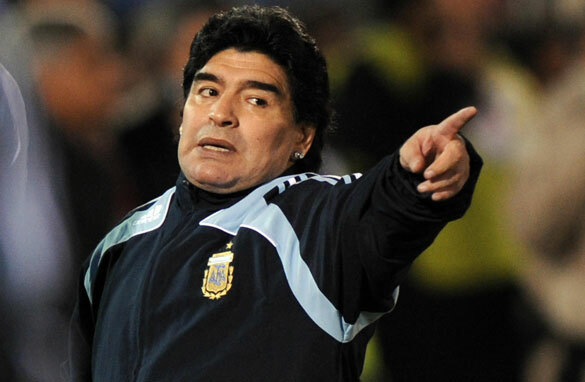 Maradona needs to work his magic to revive Argentina’s World Cup qualifying hopes. Can you remember 2002 World Cup qualification, when the shoe was on the other foot? Argentina were waltzing through qualification. They lost just once the entire campaign (away to Brazil), and ended up top of the group, 13 full points ahead of their biggest rivals. Brazil, meantime, put together a string of performances reminiscent of today’s Argentina: a loss at Ecuador, a home draw with lowly Peru. Their coach, Emerson Leao, was let go in favor of Luis Felipe Scolari. Scolari’s Brazil would immediately lose at Uruguay, and talk of missing the World Cup continued. Could it happen? Of course not - although it came down to the final day of matches! Everyone knew they had the players, maybe the best in the world. And they would prove it eight months later - defeating Germany in the World Cup final. You may think I’m nuts, but Argentina will do the same in South Africa. I just can’t figure out if it’s with Maradona or not. It’s just that level of unpredictability that’s hurt Maradona so far. He’s like a king gone mad - he has the power to do anything he wants, regardless of rationale. He’s lost four of six World Cup matches by giving debuts to players no-one’s heard of, and finding room in his team for old guys it seems he himself could have played alongside - like Palermo and Veron. Argentina have two matches remaining: at home to Peru and away to Uruguay. Thankfully, they are a month away. Plenty of time for even Maradona to realize the mistakes he’s made. I don’t think he’s that smart, but I do think he’s magic. He’s already lived a life defined by ridiculous decisions, with highs and lows most of us can’t possibly imagine. And look where he is now: coaching the two-time World Cup winners, with the second-best player on the planet, Lionel Messi. It’s not that he’ll make his next team selection with wisdom, it’s more that he can’t possibly do worse. And this time, it’s the very unpredictability that will lift his side, the magic that will work. Argentina will win both matches and end on 28 points, securing fourth place in the table and an automatic berth in South Africa. Telling Stat: Take a look at Argentina’s goals for/goals against during 2002 campaign: 42 and 15. Right now it’s 20 and 19. Argentina has a coach. Its Carlos Bianchi. He should be leading this team. I cannot believe what you wrote! How come you expect Maradona to deliver magic when his team isn't performing even decent. Come on! Outplayed by Paraguay, when the team has players like Messi, Veron, Aguero!! I genuinely thought that Messi was different but now it looks he is like all the other selfish Argentine players. Clearly he prefers to perform for the Catalan's then for the Albiceleste's. I am a die hard Argentina fan and it broke my heart to see them in this situation. It gives me chill every time I thought about it. I cannot imagine a world cup without Argentina. But it's becoming closer to reality after every game. And you are talking about magic. Only God can help Argentina today. No doubt Argentina will qualify and goes on win the world cup next year. They have too much quality for any teams . That's as high as wishful thinking can get! It would be great if Argentina could make to south africa, but that seems hard at this time... let's hope you're right! Maradona was one of the best players.... But as coach... he really doesnt have what it takes.... it actually pains me to see argentina prefoming so.... so horribly! Argentina has like one of the best teams, Messi, Aguero, Heinze, Mascherano, M. Rodriguez, Veron, Gago.... I really think riquelme should go back, there is missin a "10"
Your dreaming Argentina will make it! There is no team playing, no corrections of all his mistakes, and Maradona still believes Argentina is playing well... wake up and smell the coffee!!! It will be a big upset with maybe only 1 victory at home for Argentina, that is IF THEY GET LUCKY!!!!! Argentina will be watching the WORLD CUP home and MARADONA CRYING LIKE A BABY! Brazil will be the world cup CHAMPION, nobody can touch them now!!!! He is unable to manage his own life.....how could he the national team? I'll give you Peru at home, but I can bet the Uruguay team is itching to stick one to Argentina's favourite son. I and all England fans will be rooting for them to consign Maradona to the heap of history. There is a BIG difference between having 11 good players and having a TEAM. The players leave much to be desired, especially those who play in Europe and earn fortunes. Messi, for one. Many of us here in Argentina believe he holds back when he plays for the national team out of fear of being injured, with all that would signify for Barcelona. The players also don't have any sort of team spirit – they appear to prefer to stand out individually. I hold out little hope that Argentina will qualify, sadly. I hope I'm proven wrong. Fortunately, however, I'm also a US citizen, and will be rooting for the US team. They are certain to qualify.